Blue wedding suits There are 31 products. Italian bespoke blue royal with wide peak lapels and 1 mother of pearl button. Houndstooth wool mix fabric. 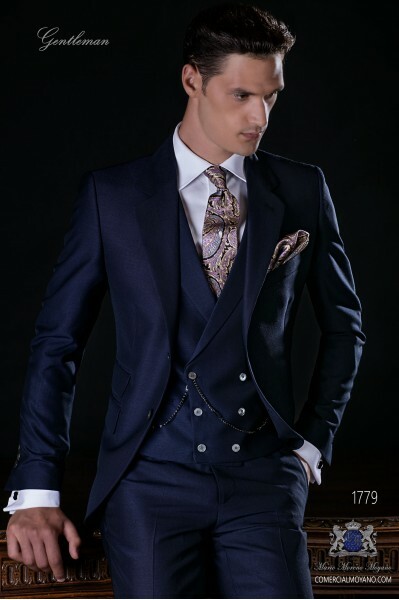 Tuxedo Wedding suit 2377 Gentleman Collection Ottavio Nuccio Gala. 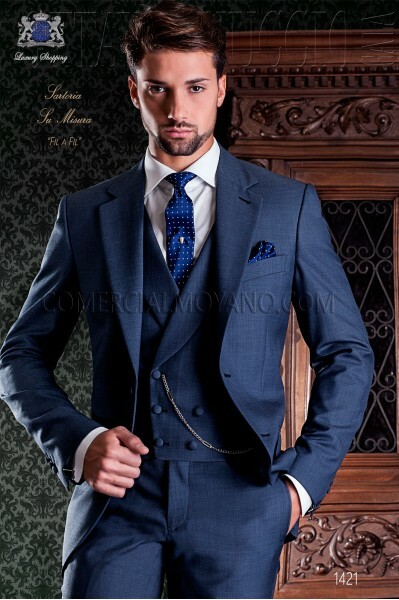 Italian blue tailored suit with beak lapel and a pearl mother button in mixed wool Pata de Gallo fabric. Tuxedo Wedding suit 2319 Gentleman Collection Ottavio Nuccio Gala. Italian bespoke royal blue suit with wide peak lapels, 2 mother of pearl buttons, ticket pocket and double vent. Mohair wool mix alpaca fabric. Tuxedo Wedding suit 2368 Gentleman Collection Ottavio Nuccio Gala. 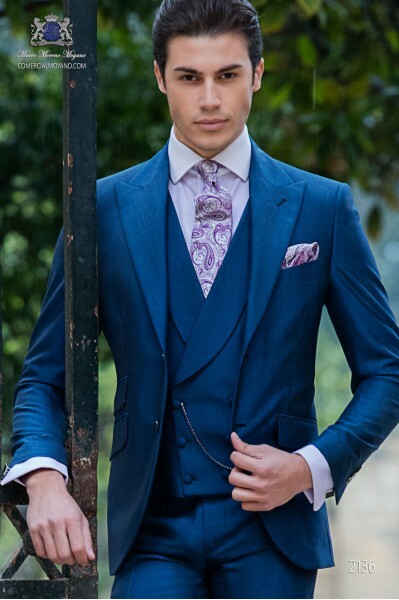 You can complete the outfit with waistcoat, double breasted, blue tie and white pure silk pocket square with blue paisley design. Italian bespoke royal blue suit with wide peak lapels, 2 mother of pearl buttons, ticket pocket and double vent. Mohair wool mix alpaca fabric. 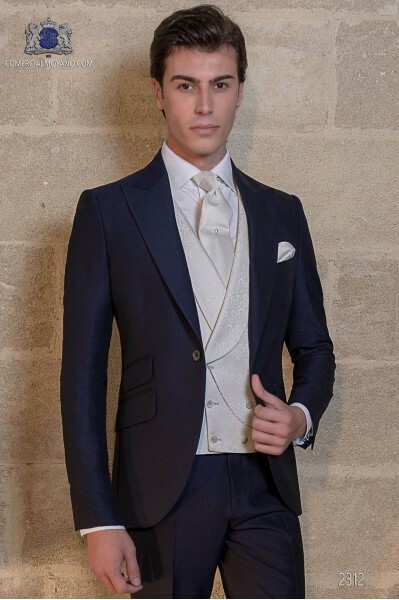 Wedding suit 1774 Gentleman Collection Ottavio Nuccio Gala. 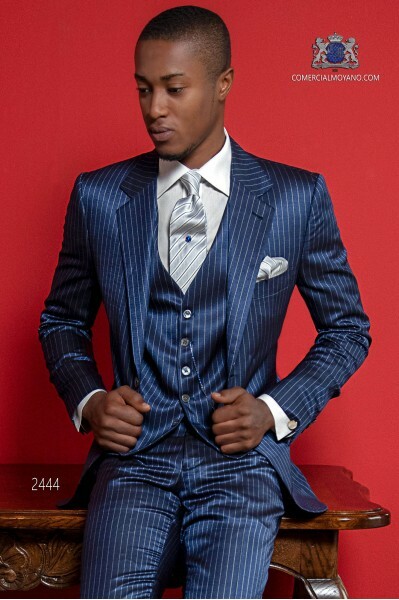 Coordinated with matching blue waistcoat with shawl lapel and 6 lined buttons. Italian bespoke navy blue suit with wide notch lapels, 1 button, ticket pocket and double vent. Mohair wool mix alpaca fabric. 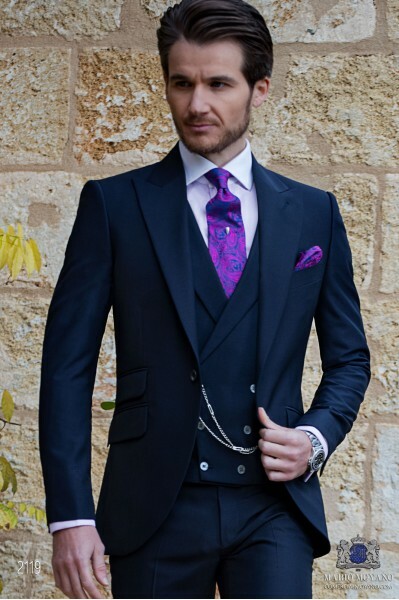 Tuxedo Wedding suit 2312 Gentleman Collection Ottavio Nuccio Gala. 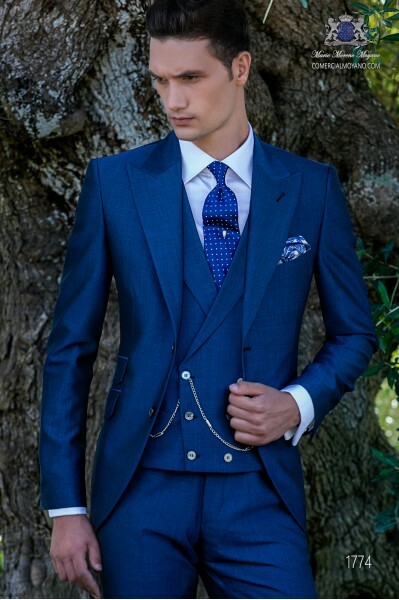 You can complete the outfit with matching blue waistcoat, double breasted, with peak lapels and 6 mother of pearl buttons. Italian bespoke navy blue suit with wide notch lapels, 1 button, ticket pocket and double vent. Mohair wool mix alpaca fabric. 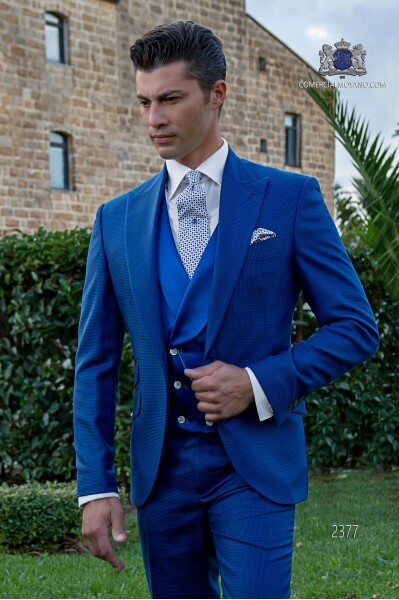 Wedding suit 2119 Gentleman Collection Ottavio Nuccio Gala. 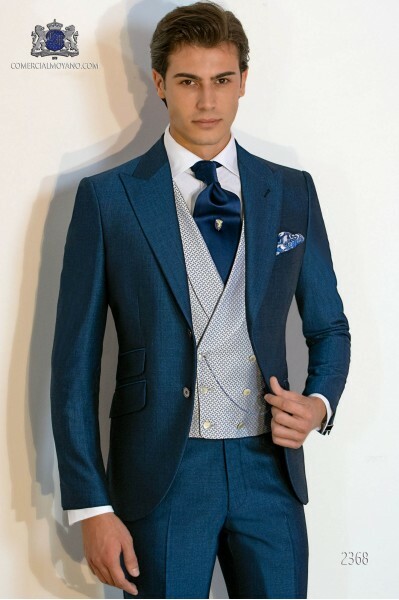 You can complete the outfit with matching blue waistcoat, double breasted, with peak lapels and 6 mother of pearl buttons. 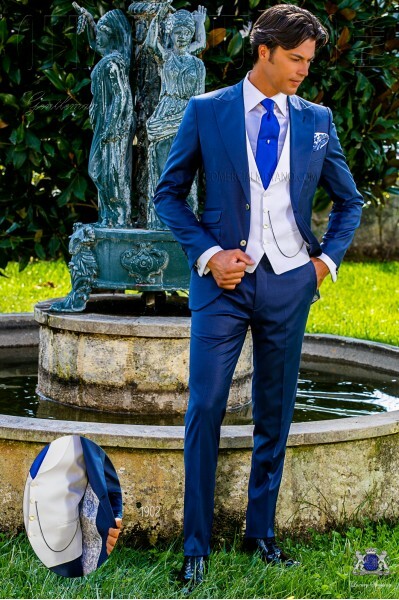 Italian royal blue groom suit. 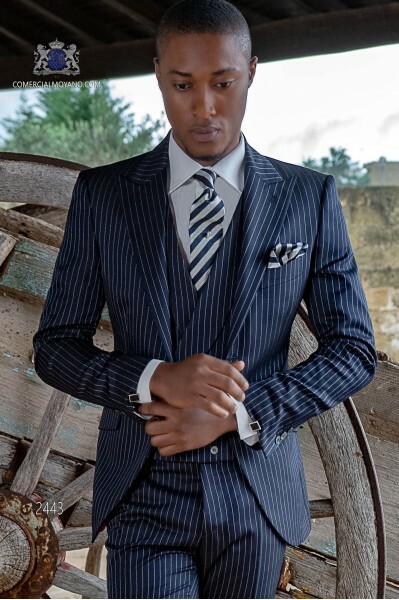 Jacket with wide peak lapel, 1 covered button and single vent. Royal blue wool mix fabric. Tuxedo Wedding suit 2321 Gentleman Collection Ottavio Nuccio Gala. Royal blue double breasted waistcoat with 6 covered buttons and royal blue with polka dots white design tie and pocket square to complete de outfit. 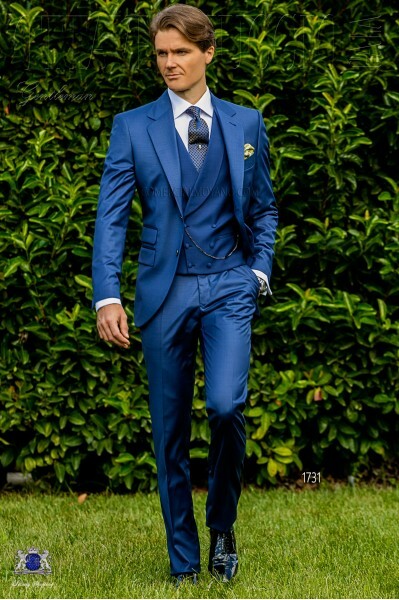 Classic Italian blue groom suit fil a fil. Classic Italian blue groom suit fil a fil. Model with classic flap, 2 buttons and 2 openings. Blue fabric fil fil mixed wool. Tuxedo Wedding suit 2322 Gentleman Collection Ottavio Nuccio Gala.Coordinated with matching waistcoat with 6 buttons and shawl flap. 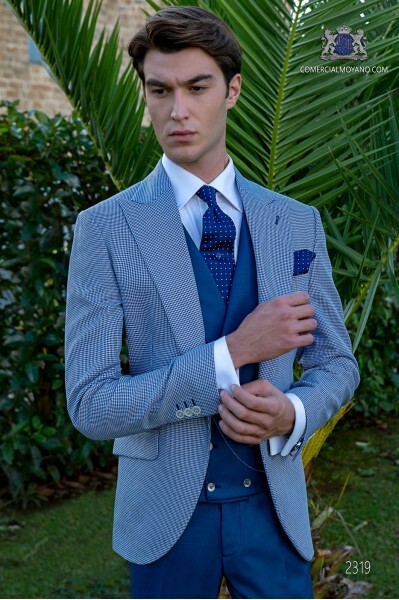 Italian bespoke blue pinstripe suit with wide peak lapels, 2 mother of pearl buttons and double vent. Wool mix fabric. Tuxedo Wedding suit 2443 Gentleman Collection Ottavio Nuccio Gala. Coordinated with crossed vest of the same fabric, 6 buttons in pearl mother and shawl lapel. 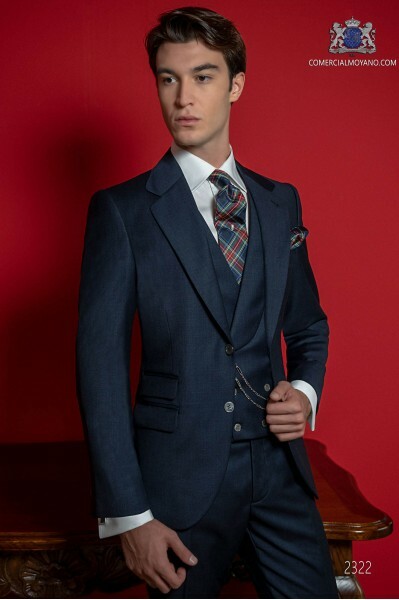 Navy blue diplomatic italian suit with wide peak lapels, 2 mother of pearl buttons and double vent. Wool mix fabric. 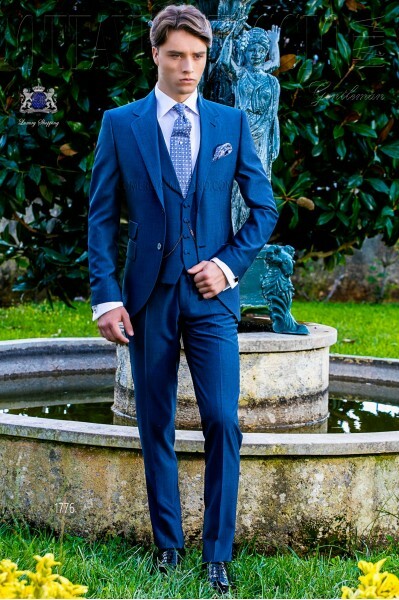 Wedding suit 2135 Gentleman Collection Ottavio Nuccio Gala. Coordinated with crossed vest of the same fabric, 6 buttons in pearl mother and shawl lapel. 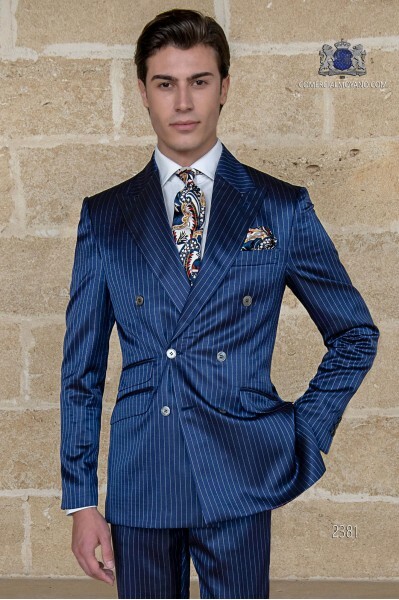 Italian diplomatic royal blue suit with classic lapel, 2 mother-of-pearl buttons and two openings. Diplomatic mixed wool fabric. Tuxedo Wedding suit 2444 Gentleman Collection Ottavio Nuccio Gala.Coordinated with a straight vest of the same fabric, 5 pearl mother buttons. 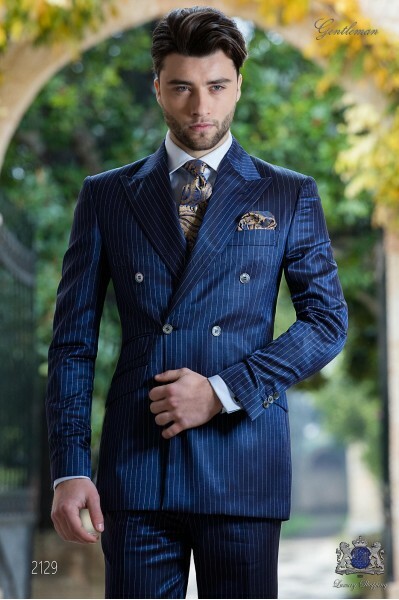 Italian bespoke royal blue pinstripe suit with wide peak lapels, 2 mother of pearl buttons and double vent. Wool mix fabric. Tuxedo Wedding suit 2382 Gentleman Collection Ottavio Nuccio Gala. Coordinated with crossed vest of the same fabric, 6 buttons in pearl mother and shawl lapel. 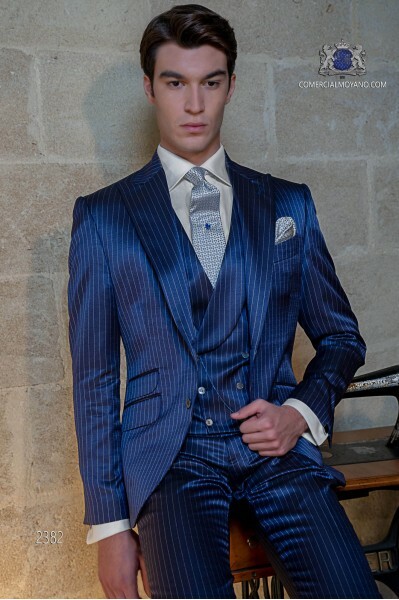 Italian bespoke royal blue pinstripe suit with wide peak lapels, 2 mother of pearl buttons and double vent. Wool mix fabric. 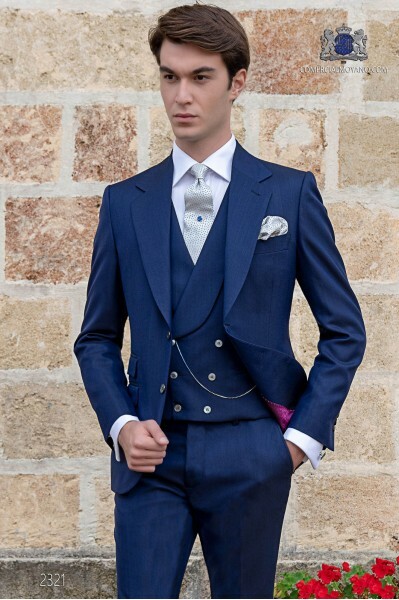 Wedding suit 2130 Gentleman Collection Ottavio Nuccio Gala. Coordinated with crossed vest of the same fabric, 6 buttons in pearl mother and shawl lapel. 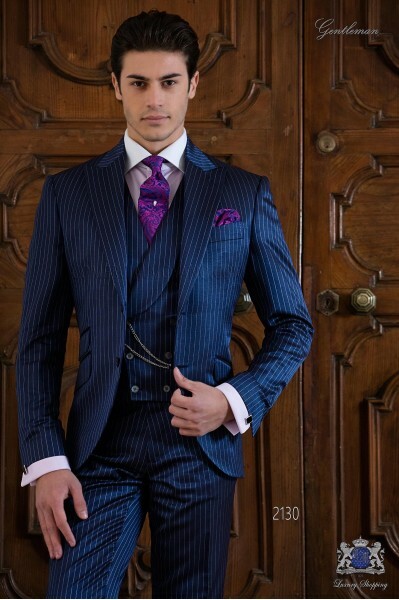 Italian bespoke royal blue pinstripe double breasted suit with wide peak lapels, 6 mother of pearl buttons and double vent. Wool mix fabric. 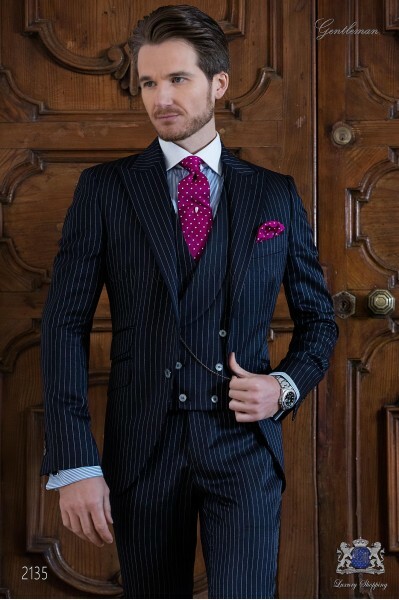 Wedding suit 2129 Gentleman Collection Ottavio Nuccio Gala. Italian bespoke blue suit with flap on peak, 2 mother of pearl buttons, ticket pocket and double vent. Prince of Wales wool mix fabric. Tuxedo Wedding suit 2389 Gentleman Collection Ottavio Nuccio Gala. You can complete the outfit with matching “Prince of Wales” waistcoat, double breasted. 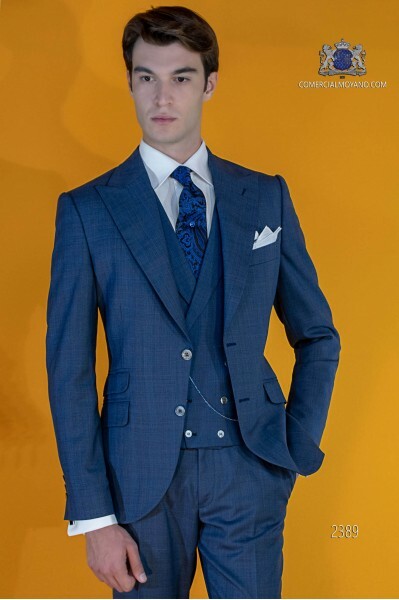 Italian classical wool mix blue tailored suit. Jacket with wide notch lapel, 2 covered buttons and double vents. Wool mix blue fabric. Suit 1421 Gentleman Collection Ottavio Nuccio Gala. Double breasted waistcoat with 6 covered buttons and tie with pocket square, royal blue and white polka dots design to complete de outfit.